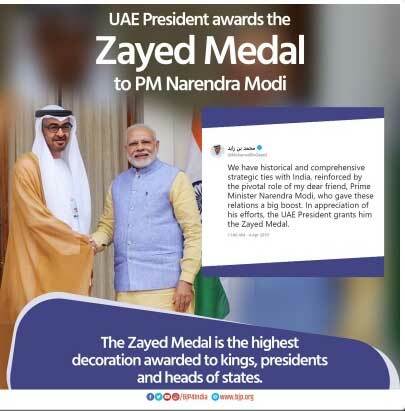 Abu Dhabi/New Delhi, April 4 The United Arab Emirates has decided to confer the countrys highest civilian award “The Order of Zayed” on Prime Minister Narendra Modi for boosting bilateral relations between the two countries. The announcement was made by Abu Dhabi Crown Prince Sheikh Mohamed bin Zayed Al Nahyan and also by the External Affairs Ministry in New Delhi. “We have historical and comprehensive strategic ties with India, reinforced by the pivotal role of my dear friend, Prime Minister Narendra Modi, who gave these relations a big boost. In appreciation of his efforts, the UAE President grants him the Zayed Medal,” the Crown Prince said in a tweet. External Affairs Minister Sushma Swaraj expressed happiness at the announcement and said India now had best-ever relations with the Islamic world and that Modi had played a stellar role in ushering in a new era of strategic partnership with the UAE. She said in tweets that it was an honour for people of India and described Modi “a great son of India”. “I am extremely happy to welcome the announcement of Order of Zayed for a great son of India Prime Minister Naendra Modi by His Highness Mohamed Bin Zayed. “This is in recognition of Prime Minister’s stellar role in ushering in a new era of strategic partnership with UAE and the best ever relations with the Islamic world. “On behalf of the people of India, I express our deep sense of gratitude to His Highness the President, His Highness the Crown Prince of UAE for this great honour. With this, you have honoured India and the people of India,” she said. Modi has already been conferred Saudi Arabia’s highest civilian honour – the King Abdulaziz Sash. The award, named after Abdulaziz Al Saud, the founder of the modern Saudi state, was presented to Modi during his visit to the country in 2016. “We greatly appreciate this honour bestowed upon PM by Crown Prince Mohammed Bin Zayed and the Government of the UAE. The UAE is home to the largest number of our citizens outside India, and is our partner in diverse pillars of cooperation, including investment, energy, defence and security,” Kumar said. Modi is expected to visit UAE to receive the award. 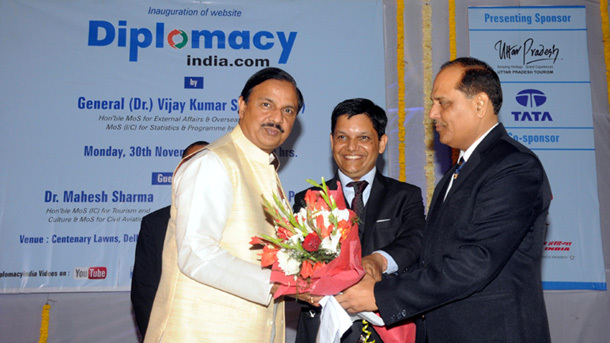 Answering queries, Kumar said that India and UAE have a strategic partnership and exchange of high-level visits is an important component of such partnership. “As and when the next visit is planned, we will share details as per established norms,” he said.